Running in the rain, to Lemon Jelly (24:20, 1:1) - Time for a nice cup of tea? I ran in the rain this afternoon whilst there was still light. It wasn't ideal - raining and dusk falling - but I was proud of myself. I got out the house, got some fresh air and rain, kept moving forward (1 minute running to 1 minute walking) and did my Sihl circuit in 24:20. I am rather heavy and large at the moment, but I can still run (slowly) and feel good about myself! 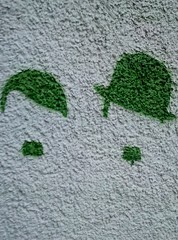 I saw this graffiti on the way and it made me think of Laurel and hardy, although looking at it again, it could be Hitler and charlie chaplin. In other running news, my lovely little sister told me on the phone tonight, that she wants to help me run my 5K and 10K with me this year. Either runnign with me, or looking after small boys! I will definitely take her up on this offer! She said that if it hadn't been for me, she would never have done her first 5K (it was a race for life in Lancaster) and she would never have believed she could run a marathon if she hadn't seen me do it. I was really touched. She ran the Liverpool marathon this year in 5 hours 4 minutes - a very respectable first marathon. "I saw this graffiti on the way and it made me think of Laurel and hardy, although looking at it again, it could be Hitler and charlie chaplin"
I had the same thought process.